Our famous freshly baked Parmesan, mozzarella and herb bread sticks to share while you wait for your meal. A rich, creamy dip to share with friends, served with our home-baked pita points. Made with crisp Jumbo Onions and golden fried. Served with sides of ranch dressing & BBQ Sauce. With your choice of BBQ, Buffalo, Mango Habanero, Honey Mustard or Ranch Dipping sauces, served on a heap of our classic french fries. Deep-fried and served with our own marinara sauce. Choose from Garlic Parmesan, BBQ, Spicy Buffalo, Mango Habanero, or Thermonuclear Hot Sriracha Wings One pound (before cooking) of wings served with celery strips and Ranch or Blue cheese dressing. Served with fresh Roma tomatoes, cucumbers, Romaine lettuce, onions, green bell peppers, Kalamata olives, pepperoncinis, Feta cheese and Mom's Greek dressing. (Serves 1 or 2). Chicken breast, ham and cheddar on top of a generous house salad with your choice of dressing. Fresh spinach, sliced gyro meat, feta cheese, red onion, Kalamata olives, Roma tomatoes, and pita points with our tangy Greek dressing and creamy cucumber-dill tzatziki dressing on the side. Sliced ham, Pepperoni, Italian Salami, Provolone cheese, tomatoes, Feta cheese, pepperoncini peppers, lettuce, Roma tomatoes, cucumbers, green peppers, onions, Kalamata olives and our homemade Italian vinaigrette dressing. Less than 10 net carbs. Tender fried chicken breast, marinara sauce, Parmesan and provolone cheeses. Plump, juicy beef meatballs with marinara sauce and mozzarella cheese. Pepperoni , ham, Italian Salami, Provolone cheese, lettuce, and tomato, with cherry peppers and homemade Italian dressing. Served hot or cold. The Texas-Style is made with a grilled chicken breast, cheddar cheese and our tangy BBQ Sauce. Or, if you like it spicy, get the Bualo-Style, made with a fried chicken breast, cheddar cheese, and kicked up with our spicy cayenne sauce. Served with blue cheese or ranch on request. Ask for Sriracha if you want it super-spicy! Fried chicken breast, provolone cheese, fresh spinach and our garlic parmesan sauce. Butterflied spicy Italian link sausage with our marinara sauce, topped with melted provolone cheese. Add grilled onions & peppers upon request at no additional charge! Sliced Italian ham, Provolone cheese, lettuce, and tomato, with hot cherry peppers and our homemade Italian dressing Served hot or cold. Tender grilled chicken with bacon, provolone and Ranch dressing. Your choice of thinly sliced steak or chicken with grilled onions, grilled mushrooms, and Provolone cheese, served with hot peppers on the side. Substitute American cheese or our House-made Beer cheese for provolone cheese if you want your Philly gooey. Served with garden salad and fresh-baked bread, featuring house made marinara sauce. Add Meatballs...$2.99 per serving. A traditional Tuscany cream sauce tossed with Romano cheese, spinach, herbs and penne noodles. Melted Parmesan and mozzarella cheeses over spaghetti al dente & meatballs with marinara sauce. Mama mia! Penne pasta, Roma tomatoes, marinara, ricotta and Romano cheeses, topped with mozzarella and baked in the oven. Layered flat pasta stuffed with ricotta, lean ground beef and herbs topped with marinara sauce and mozzarella cheese. Tender fried chicken breast with marinara sauce, Parmesan and provolone cheese. Served over spaghetti. A house specialty. Penne pasta tossed with vodka, sliced spicy Italian sausage links, spinach, tomatoes, Romano and tomato cream sauce. ffed with Italian ham, pepperoni, Italian sausage and three cheeses served with our fresh herb marinara sauce. Dough Boy’s Original Pizza is made with our hand-crafted, thinner-style crust. Our Pan-Style Pizza is made by allowing the dough to rise naturally to produce a light, golden crust. 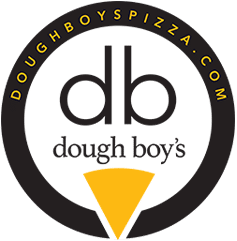 In the adventuresome and diverse spirit of the coastal cafés and bistros of Southern California, at Dough Boy’s®, we believe that unusual, inspiring and exciting toppings and sauces gracefully enhance a superior pizza crust. Pizza sauce, herbs and spices, topped with mozzarella cheese, ham and pineapple. Tomatoes, onions, black olives, green bell peppers, oregano, garlic and mozzarella cheese, topped with cool Feta cheese. Chicken breast, BBQ sauce, sliced red onions, cheddar and mozzarella cheeses. Fried chicken, bacon, cheddar and mozzarella cheeses with Ranch dipping sauce. On a base of our own pizza sauce and cheese, we add thinly sliced steak blended with secret herbs and smothered with fresh grilled onions and grilled mushrooms. Garnished with cherry peppers. A take-off on the pizza that won 1st place in the American Pizza Championship, this pie has sliced spicy Italian link sausage, spinach, Romano and mozzarella cheeses with our tomato, vodka cream sauce. Chicken, pineapple, pan-seared garlic and spices with our tomato sauce and mozzarella cheese. Our way of doing the original on a pizza - sliced ham and chicken with cream sauce topped with four cheeses, Romano, mozzarella, Provolone and cheddar. Our spicy, but not too spicy wing sauce with sharp cheddar, mozzarella, chicken, and of course, blue cheese to dip. If you were thinking of ordering our famous wings and a pizza, think again and try the best of both worlds all in one. Ask for Sriracha if you want it real spicy! Romano, mozzarella, Provolone, ricotta and Feta cheeses, with Roma tomatoes, garlic, olive oil, herbs & spices. Sliced spicy Italian link sausage, onions, green peppers, Romano, provolone and mozzarella cheeses on our pizza sauce. It's big, fat pizza with sliced rotisserie gyro meat and our original pizza sauce, topped with mozzarella, tomato, Kalamata olives, onion and pepperoncini peppers Tzatziki sauce on request on the side. Romano and mozzarella cheeses, spinach, garlic, olive oil, herbs, Roma tomatoes, bacon and a sprinkle of cool Feta cheese. ``The all-time favorite of combos.`` Pepperoni, Italian sausage, fresh mushrooms, onions, green bell peppers, and extra mozzarella cheese. For meat lovers only! Sliced ham, steak, pepperoni, Italian sausage and beef meatballs with mozzarella cheese and our own zesty tomato sauce. Our rich, creamy Parmesan and artichoke sauce topped with baked chicken, spinach, Roma tomatoes, Parmesan, mozzarella, and provolone cheeses. Dough Boy’s all-time favorite burger. Our Angus burger topped with beer battered onion rings, bacon, BBQ sauce, and cheddar. A fun and familiar combination of liquors and mixes!..Safe only if you have a designated driver or if you’re walking back to your hotel room! Hand-folded dough puffs to share, stuffed with meatball, spinach, Ricotta and Parmesan Cheeses. Served with Marinara dipping sauce. Loads of Mozzarella cheese, pepperoni and pizza sauce. f Thousand Island, Blue Cheese, Ranch, Homemade Italian Vinaigrette, Caesar or Honey Mustard dressings. Penne pasta with sauteed meatballs, green pepper and onion tossed with rich Alfredo sauce, Parmesan Cheese and kicked up with spicy Sriracha. Bam! All American -1/2 lb. Angus Burgers!! All burgers are made with 1/2 POUND of fresh Angus beef, prepared medium to well done and served with our seasoned fries and a dill pickle spear. Our thick 1/2 Pound Burgers are made to order, so allow a little extra time for cooking. Substitute our Beer Batter-Dipped Onion Rings instead of french fries, add .99. All sandwiches served with cherry peppers, dill pickle wedge and Classic Fries dusted with our special seasonings. Substitute Jumbo Beer Batter-Dipped Onion Rings instead of fries, add .99.